In blogger there is no option to add a logo directly in a blog, but many bloggers add logo to their blogs and those who are beginners to blogging get confused about it. Everybody know that logo can be added to blog only by navigating to layout but it isn't so easy as you can find only favicon in your blog's layout. Because adding logo option is hidden inside Header. The reason for adding a logo to your blog is it makes your blog look decent other than this its trademark for your content. (1). First of all create a logo, you can create a logo using paint in your computer. Be sure to have a logo having width 417-450 pixels and 90-95 pixels. In case of a bigger logo blogger will not accept it. (2). 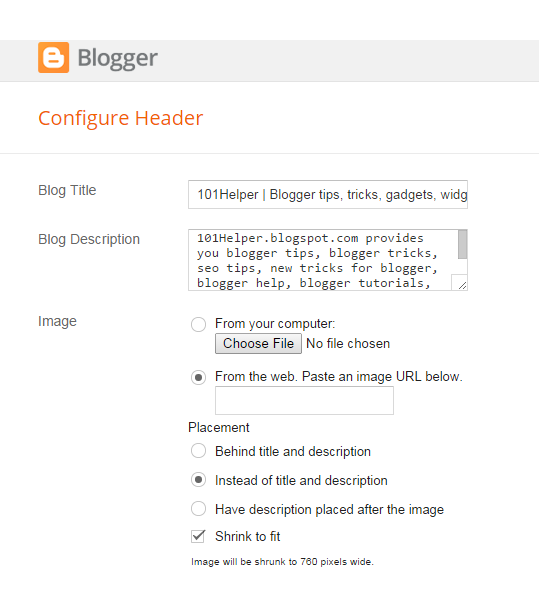 Go to Blogger Dashboard. (4). When you click edit a pop-up window will open, check from your computer option in the opened window and click choose file to upload it. When the upload completes check shrink to fit option. (5). After following step 4 move to step 5 in this step we are going to decide how the logo will look either behind title and description, instead of title and description or have a description after the image, don't check behind title and description because if you check this option your blog title and description will appear on your logo, check the instead of title and description to have a clean and clear logo but if you want a description after your logo then check the third option(have a description after the image). (6). Click save and you are done successfully! open your blog to see you logo. Note: If blogger isn't accepting your logo then re-size it to width 417 pixels and 90 pixels. I hope this post was helpful to you in adding logo to your blog, share your blog url below if you have read this post for adding logo. If you have any problem ask me in comments. Recommend this post on google(g+1) if you like it. Tags: Logo for blog, blogger logos, create free logo, 101Helper logo adding tutorial, how to add logo to your blog, tutorials for bloggers, blogging tricks ans tips.